Great meals don't have to be difficult or time-consuming-and award-winning cookbook author Anne Willan proves this with scores of tasty dishes, many of which require less than half an hour to put together. With easy recipes for dishes like Mussel Stew with Saffron and Cream, Hot Toddy Chicken Breasts, and even Three-Cheese Macaroni, this book is a must-have for great weekday family cooking. The key to quick, quality cooking is organization. To that end, Good Food No Fuss is split into eight sections that speed home chefs to the right recipe: Thirty Minutes to the Table, One-Pot Meals, Family Fare, No-Cook Suppers and Salads, Lightly Vegetarian, Perfect for Parties, Fast Finishes, and Happy Endings. Each of these handy divisions includes more than a dozen recipes, hints, tips, wine recommendations, and variations on the theme. 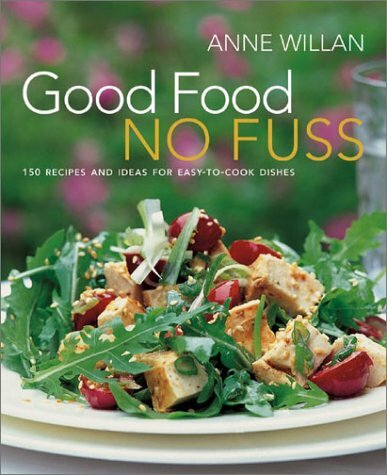 Anne Willan has more than 30 years' culinary experience as an author, columnist, and teacher. Her more than a dozen books on food have been translated into 24 languages and sold hundreds of thousands of copies. Willan studied and taught cooking in London and Paris before moving to the United States to become a food editor. She now lives in France.